Combine farro with 4 cups of water in a saucepan. Bring to a boil over high heat. Reduce heat to medium-low, cover and simmer until grains are nearly tender (about 20 minutes). Add one teaspoon salt, stir and simmer until grains are tender (another 10 minutes or so). Drain excess water, then place grains into a large bowl to cool. Preheat oven to 400 degrees. Toss onion with enough oil to lightly coat, but not soak. Spread across a baking sheet and sprinkle with a large pinch of salt. Toss sweet potato with oil in a similar fashion and spread on a second sheet. Sprinkle with cumin, coriander and a pinch of salt. Place both baking sheets in the oven and roast until tender and onions begin to brown. The onions will be done before the sweet potatoes. Stir and turn vegetables at least once during cooking. When vegetables are nearly done roasting spread walnuts on a third sheet (or in an oven-safe dish, if you’ve run out of baking sheets) and toast until they have darkened in color and are fragrant (about 5 to 8 minutes). Keep a close eye on the nuts as they will easily burn in a hot oven. If you prefer, wait until the vegetables have finished and been removed from the oven, then turn the temperature down and toast the nuts. When nuts are done, cool completely, then roughly chop in small pieces. While vegetables and nuts cook heat one to two tablespoons of oil in a large skillet. Add kale and garlic and cook lightly until kale has wilted but is still bright green in color. Stir to cook evenly. Scrape cooked greens mixture into the bowl with farro. Add sweet potatoes and onion. Stir the ingredients together, then drizzle with a bit of your best extra-virgin olive oil to moisten (a tablespoon or so) plus lemon juice to taste (about one tablespoon, or less, if you are using ordinary lemon juice which is more tart than Meyer lemon). Taste and add salt as needed. Gently stir in walnuts and pomegranate seeds. 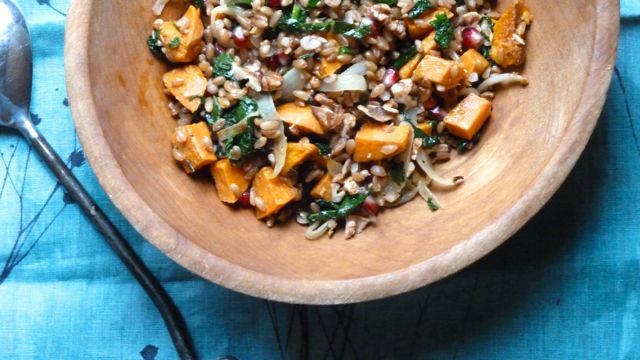 This entry was posted in Recipes and tagged farro, kale, pomegranate, sweet potato, vegan, whole grain by Four Cooking Together. Bookmark the permalink. Pingback: Happy New Year! plus a festive Brussel Sprouts with Pomegranate Seeds recipe » Zest for Life Today - Eat well. Be well. Thrive.